I hope you have had a chance to read Part 1 of this article before reading this one. 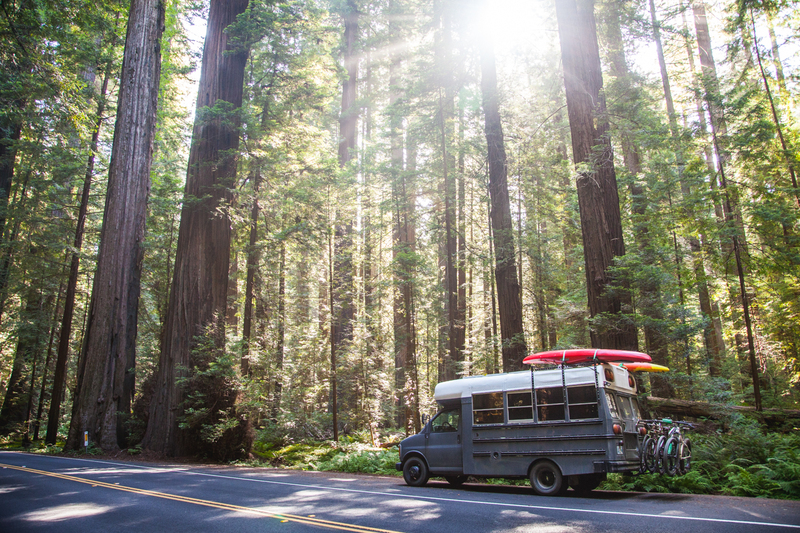 In the first article on this topic we cover some of the negative aspects of living in a Skoolie-conversion, a lot of which we did not expect before leaving for a period of extended travel across the United States. Firstly, when living in a school bus conversion, there is enough room to bring anything you would need for an adventure. We have a very small bus and are still able to cram in a queen-sized bed, a big refrigerator, all of the camera equipment we could need, 4 bicycles, 2 kayaks, and more books than we will be able to read through the course of the summer. Our school bus is around 75 square-feet of living space and that is A LOT compared to conversion vans and truck campers. We have friends that travel in off-road trucks with slide-ins or roof top tents and the first thing they comment on is the space. “There is so much room for activities!” All Will Ferrell quotes aside, when it rains, snows, or drops below freezing, we are warm and dry inside. Rachael’s yoga practice can still carry on even if there is a torrential downpour outside. 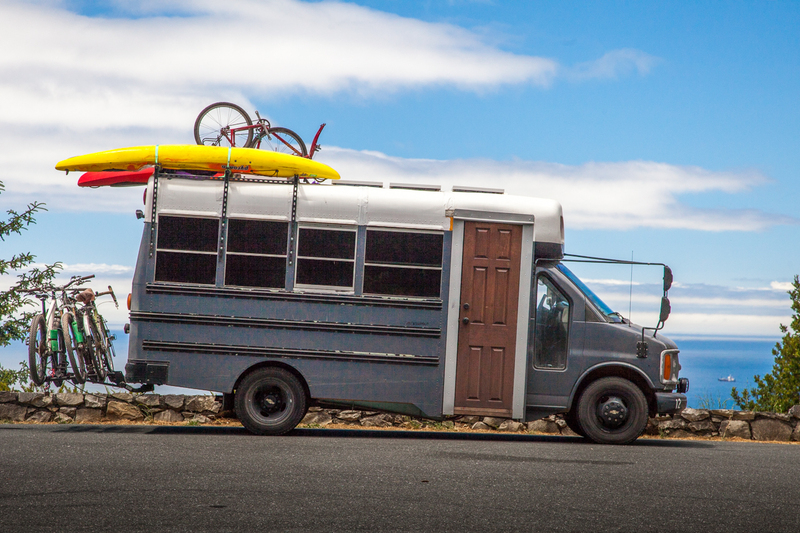 Another aspect of traveling in a Skoolie is that the design is 100% customizable! The builder can customize the design and layout however they see fit. 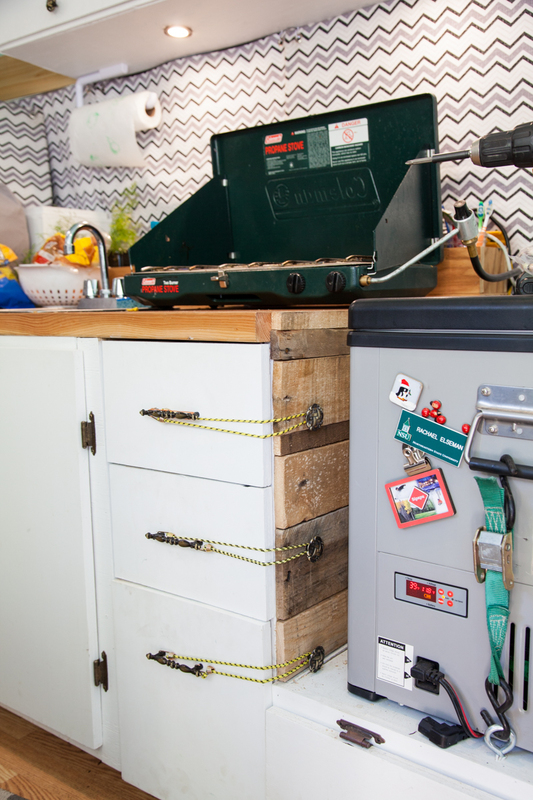 Once the seats and the floor are yanked out, the bus can be built to include anything that you can fit in the space. Cruise the interwebs for a bit and you will find Skoolies with 2000+ watt solar systems, full-size bathtubs, mobile workstations, the opportunities inside are endless. The biggest challenge is making the decision on toilet vs. no toilet. An aspect of Skoolie ownership that we did not expect is that Skoolies, especially short Skoolies, are surprisingly capable off-road. No, we are not seeking out off-road opportunities to test the flex of our suspension or drive through 4-foot deep mud holes, but to get to more remote campsites we have endured some off-camber and sketchy situations. Smaller busses are built on similar chassis to full-size trucks, so in general, there shouldn’t be much difference between taking a Chevy 3500 Silverado and the Okienomad’s Skoolie down a Forest Service road. The motor in our bus is shared with the military Humvee and a lot of farm trucks and Suburban’s of the past 25 years, so it is no surprise that when geared right, out bus will climb up and over some stuff. Below is a photo of a campsite that we were rewarded with after an arduous climb up a rutted Forest Service road near Anza, CA. Worth it! As mentioned in Part 1 of this article, one of our favorite and least favorite parts of Skoolie overland travel is that Skoolies are slow! How slow you ask? We got passed by a full-size pickup hauling a trailer that had to have been 12,000 pounds or more like we were standing still. I couldn’t even recognize the make of the truck it was moving so fast, or err, we were moving so slowly. 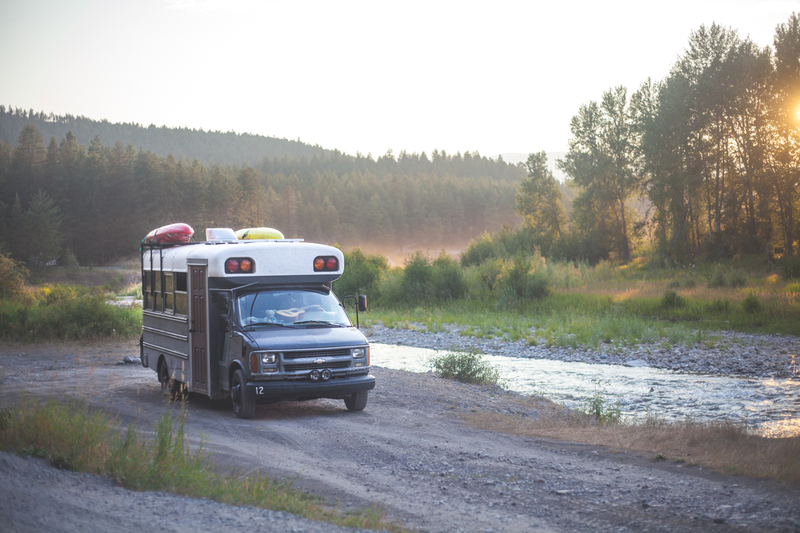 The slow speed of the Skoolie up mountain passes, around turns, and over washboard roads makes it the perfect overlanding vehicle, you simply see more than if you were flying by at 75 miles per hour in a new sprinter van. If we had to choose, we would travel slow every day of the year and not miss a minute of it. One of my favorite aspects of bus travel is that Skoolie conversions do less damage to the environment. Keep in mind that traveling a ton of miles on a less-than-efficient diesel engine through beautiful forests and deserts is not exactly healthy for the environment, however, keeping a big hunk of metal out of a scrap yard and in use is a win for the environment when you consider the alternative of buying a newer vehicle such as an RV or full-size truck camper. We have recycled our bus from its previous life of shuttling kids to a new life of seeing beautiful things every day. Once we are done with our travels in the bus we will likely park the bus somewhere nice and quiet and use it as a cabin in the woods or a suite for the visiting in-laws or parents. We will only need to add a composting toilet or outhouse and a small shower area to make the Skoolie 100% livable off-grid, reducing the need to use a ton of new material to build a new house someday. 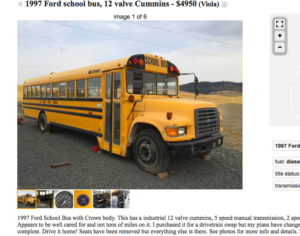 A Skoolie for sale now! 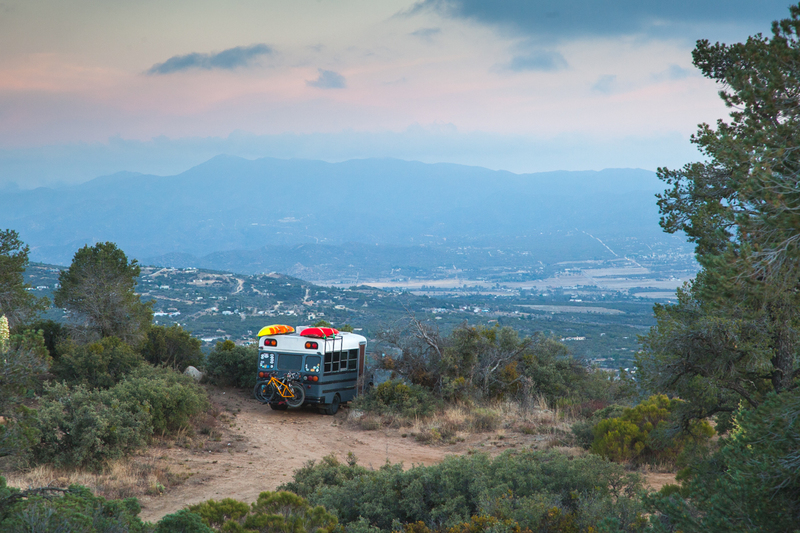 Lastly in our list of reasons why a Skoolie is a great overlanding vehicle is that Skoolies are cheap! School districts, churches, and metropolitan transit companies are constantly shuttling out (pun intended) gently used, fleet-maintained vehicle for rock-bottom prices. Most of these vehicles have been maintained since day-one by competent mechanics and are usually on the auction block with less than 200,000 miles on them, a considerably small amount in regards to the life of a well-maintained diesel engine. Our bus came to us with 107,000 miles on it and other than some neglected maintenance issues by the second owner of the bus, we have had 13,000+ trouble-free miles out of it. Not only are skoolies cheap to buy, they are cheap to build. You don’t have to have an Insta-famous porcelain tub or a teak-wood deck on the roof of your bus. 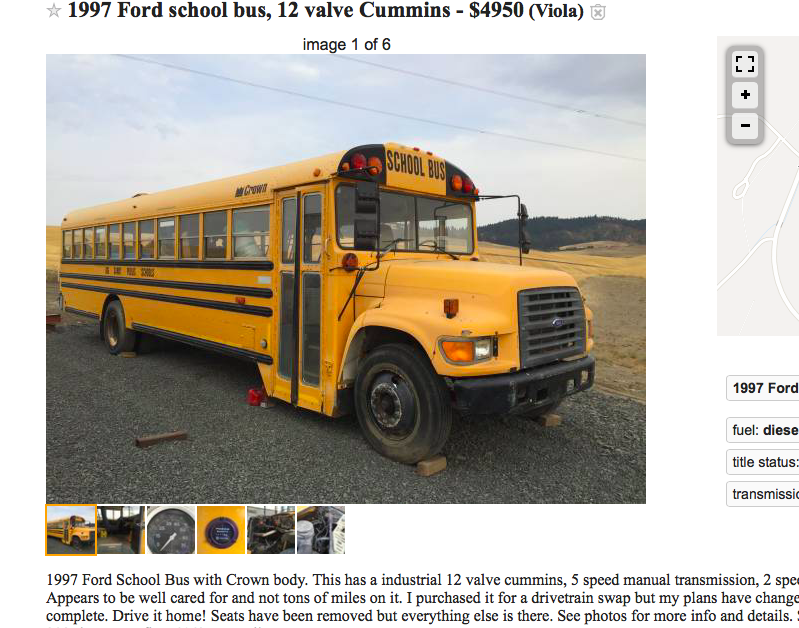 You can build a bus that is simple 2×4 and plywood construction, slap on a little paint and you are good to hit the road. Our bus was built with materials that are cheap and available at any hardware store with tools that most people already own. If you are still hanging on through all of that negative, I hope you have had the chances to read Part 2 of this article, Skoolie Overland Travel Part 2: Why a Skoolie-Conversion Makes a Bad Travel Rig. We are really happy with our choice to hit the road in our Skoolie and we wouldn’t trade the experience for anything. If you have enjoyed our article, please explore the blog some more as there are tons of stories, write-ups, and photos from our travels around the country. If you want a more streamlined media feed, check out our Instagram and Facebook pages, thanks for stopping by!